OK so the bookshop staircase is not going as fast as I would like. Therefore I have to keep you entertained. Here goes. How about shoe making. I am going to start you off with the simplest of simple scuff slippers. For these you will need a very thin piece of leather for the outer sole, some card stock for the inner sole and a piece of fancy braid or trim 1/4" or less in width. The pink flowered one that you see in the step by step photo is from a plain old fabric store. 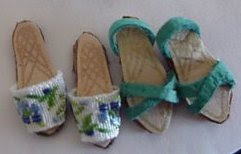 The fancy green and purple ones in this photo(front) are trims from a mini show. Basically, if you know how to make these you can branch off and make sandals of other kinds too. This is the sole pattern. I usually make these about 3/4" long. That's about the size of my big feet(9"). You can make them smaller or larger if you wish. 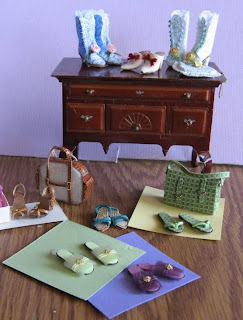 You will cut two(mirror images) of leather and two a tiny bit smaller of colored card stock. You can fancy this up with a gel pen if you so desire. I kind of like them with a bit of pattern on the inside. Next you will cut a piece of the ribbon or trim about 1/2" long, cut at an angle(see #1). There are no specific measurements on this because you may make the sole larger or smaller. You will see when you start to glue if you need to trim a bit off. Glue the wrong side of the ribbon to the bottom side of the card stock. Let it dry a bit and then wrap the other end around and glue it to the bottom. If you want a heel on the scuff cut a piece of leather the same size as the back end of the scuff about to the place where the sole starts to widen. Glue that to the bottom. Last step is to glue the leather sole to the bottom of the scuff so that it sandwiches the ends of the ribbon between the sole and the liner. Do it again(Mirror image!) and you have a pair of slippers. I use the same sole for all of my shoe patterns and pretty much the same method. The top gets wrapped around to the back of the card stock and then the outer sole gets glued to that. Your next step would be the turquoise sandals. They are thin strips of turquoise leather that are crossed in the front and glued to the back. The back strap is simply a strip glued in a U shape. Then the sole is attached to cover the bottom. My daughter and I have come up with all kinds of shoes from this starting point. I have even done cork soled espadrilles. Meanwhile I am going back upstairs. Have fun experimenting. Wow! So cute! Lovely little tutorial!